Targeted DNA epigenome editing represents a powerful therapeutic approach. This protocol describes the production, purification, and concentration of all-in-one lentiviral vectors harboring the CRISPR-dCas9-DNMT3A transgene for epigenome-editing applications in human induced pluripotent stem cell (hiPSC)-derived neurons. Tagliafierro, L., Ilich, E., Moncalvo, M., Gu, J., Sriskanda, A., Grenier, C., Murphy, S. K., Chiba-Falek, O., Kantor, B. Lentiviral Vector Platform for the Efficient Delivery of Epigenome-editing Tools into Human Induced Pluripotent Stem Cell-derived Disease Models. J. Vis. Exp. (145), e59241, doi:10.3791/59241 (2019). The use of hiPSC-derived cells represents a valuable approach to study human neurodegenerative diseases. Here, we describe an optimized protocol for the differentiation of hiPSCs derived from a patient with the triplication of the alpha-synuclein gene (SNCA) locus into Parkinson’s disease (PD)-relevant dopaminergic neuronal populations. Accumulating evidence has shown that high levels of SNCA are causative for the development of PD. Recognizing the unmet need to establish novel therapeutic approaches for PD, especially those targeting the regulation of SNCA expression, we recently developed a CRISPR/dCas9-DNA-methylation-based system to epigenetically modulate SNCA transcription by enriching methylation levels at the SNCA intron 1 regulatory region. To deliver the system, consisting of a dead (deactivated) version of Cas9 (dCas9) fused with the catalytic domain of the DNA methyltransferase enzyme 3A (DNMT3A), a lentiviral vector is used. This system is applied to cells with the triplication of the SNCA locus and reduces the SNCA-mRNA and protein levels by about 30% through the targeted DNA methylation of SNCA intron 1. The fine-tuned downregulation of the SNCA levels rescues disease-related cellular phenotypes. In the current protocol, we aim to describe a step-by-step procedure for differentiating hiPSCs into neural progenitor cells (NPCs) and the establishment and validation of pyrosequencing assays for the evaluation of the methylation profile in the SNCA intron 1. To outline in more detail the lentivirus-CRISPR/dCas9 system used in these experiments, this protocol describes how to produce, purify, and concentrate lentiviral vectors and to highlight their suitability for epigenome- and genome-editing applications using hiPSCs and NPCs. The protocol is easily adaptable and can be used to produce high titer lentiviruses for in vitro and in vivo applications. Multiple epigenome-editing platforms have been recently developed to target any DNA sequences in the regions that control gene expression1,2. The created epigenome-editing tools are designed to (i) regulate transcription, (ii) alter posttranslational histone modifications, (iii) modify DNA methylation, and (iv) modulate regulatory element interactions. The approach to anchor the transcription/chromatin modifiers to a deactivated (dead) Cas9 (dCas9) raised from previously developed epigenome-editing platforms, such as zinc finger proteins (ZFPs) and transcription activator-like effectors (TALEs), harboring a potent transcriptional effector domain (ED) fused to the designed DNA-binding domain (DBD)3. The outcomes of the desired phenotype such as activation or repression is defined by the effector molecule anchored to the endogenous loci (Figure 1). To create programmable transcriptional activators, dCas9/gRNA modules are linked to VP164,5,6 (Figure 1A), a viral activation domain that recruits Pol II and the general transcription machinery. The modification of this system has included VP64, a tetramer of VP16 domains, providing an even more robust activation rate5,6. The system has been successfully employed to activate coding and noncoding regions by targeting promoters and regulatory elements. Importantly, even though VP64 molecules do not directly modify the chromatin structure in the target region, it recruits chromatin modifiers which bind results in deposition of the active (euchromatin) marks, including as H3/H4 acetylation and H3-K4 di/tri-methylation5,6. In addition to VP64, the p65 subunit of the human NF-κB complex has been tethered to the dCas9/gRNA module7. Interestingly, the tethering of these effectors to the regions upstream of transcription start sites (TSSs) and within promoters results in a strong gene induction. Nevertheless, VP64 and p65 effectors can also exert the activatory effects while being linked to the regions located downstream of TSSs and at distal enhancers7,8. To elicit a more robust transcriptional response, multiple dCas9-VP64 or dCas9-p65 fusions need to be recruited to a single target locus9,10. As such, the recent development of next-generation activators, which recruit multiple effector domains by a single dCas9-gRNA complex, such as SunTag, has resulted in a stronger activation capability comparing to dCas9-VP64 fusion counterparts11,12. An improved transcriptional activation has been obtained through the fusion of VP64, p65, and Rta (VPR), a transactivation domain from gamma-herpesviruses, to the C-terminus of dCas913 (Figure 1A). Similar CRISPR/dCas9 systems have been developed for target-specific repression (Figure 1B). 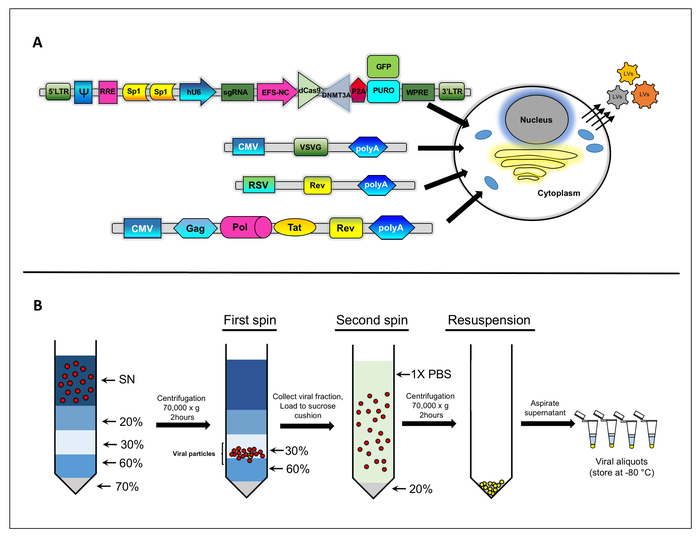 Endogenous gene repression can be achieved with engineered repressor fusions through a variety of mechanisms (Figure 1B). It has been demonstrated that CRISPR/dCas9 systems, linked to the repressor DBD (even without an effector domain/s), can efficiently silence gene expression while tethered to a promoter or upstream/downstream-TSS regions3,6,14. The effects on transcription is caused by the steric interference of transcription factor binding and RNA polymerase processing. Nevertheless, more comprehensive approaches are needed, as gene repression by steric hindrance alone is often not sufficient for robust silencing. The recent development of the next generation of silencers based on CRISPR/dCas9 systems carrying transcriptional repressor domains (TRDs), histone modifiers (H3-K9 di-/tri-methylation, H3-K27 di-/tri-methylation; H3-K36 di-/tri-methylation, H3/H4 deacetylation), and DNA (CpG) methylation led to the construction of epigenetic tools allowing more robust silencing effects4,5,15,16,17,18,19,20. It has been demonstrated that the recruitment of these epigenetic modifiers to the DNA may lead to the formation of more closed and condensed chromatin, which typically generate a more potent silencing outcome21,22. The most commonly silencing domain used with DBDs is the Krüppel-associated box (KRAB)4,5. The recruitment of the factor has been demonstrated to correspond with chromatin changes; nevertheless, the mechanisms of these modifications are yet to be elucidated16,17,18. 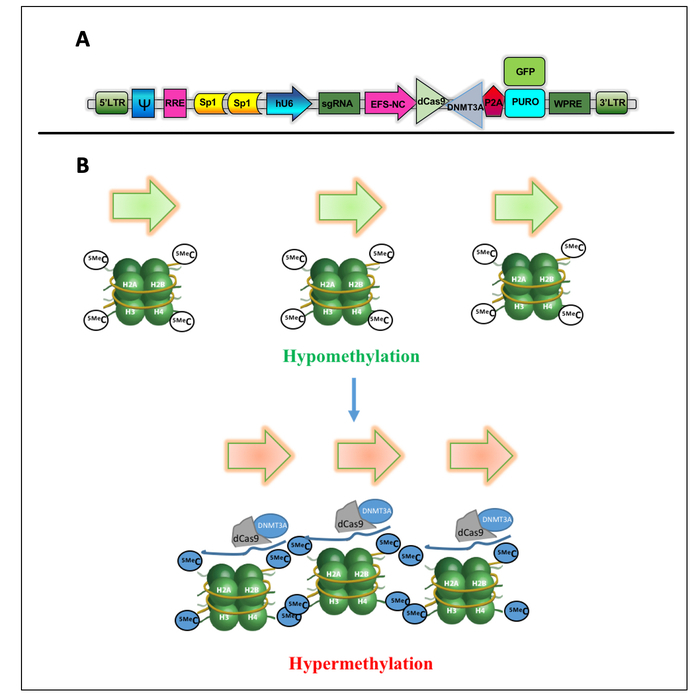 Recently, it has been shown that the localization of KRAB to DNA can promote the assembly of the histone methyltransferase SETDB1 and the histone deacetylation (HDAC) NuRD complexes, suggesting the possibility that these interactions mediate the formation of chromatin condensation and transcriptional silencing3,13. As an alternative approach, effector domains can be fused to DBDs to create a custom epigenetic silencing protein. This system directly catalyzes repressive DNA marks or histone modifications. Recently, the use of synthetic CRISPR/dCas9 systems tethered to the DNMT3A enzyme has been repurposed for transcriptional deactivation. 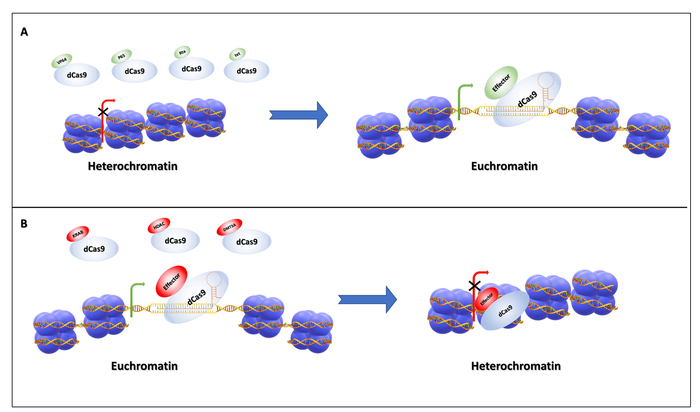 DNMT3A catalyzes DNA methylation that exerts transcriptional repression throughout the formation of heterochromatin on endogenous gene promoters and other regulatory regions (Figure 1B)18,20. McDonald et al.18 and Vojta et al.20 were the first authors to report that DNA methylation can be used for epigenome-gene silencing or repression, demonstrating that the plasmid-delivered dCas9-DNMT3A fusion system can potently enhance cytosine methylation around the TSS18,20. McDonald and coworkers demonstrated that the employment of the strategy may result in a significant reduction (about 40%) in a tumor-suppressor gene, CDKN2A mRNA levels18. Similarly, targeting the unmethylated promoter region of the BACH or IL6ST genes shows increased CpG methylation that has been correlated with a twofold reduction in the gene expression20. Our lab has recently repurposed the use of DNA methylation for attenuating the pathological outcomes of SNCA overexpression (Figure 2)23. The strategy is based on selective enhancement in DNA methylation within the SNCA intron 1 region, as it was previously reported to be hypomethylated in PD and dementia with Lewy bodies (DLB) brains24,25,26. This hypomethylation has been linked to SNCA overexpression, thus offering an attractive target for therapeutic intervention24,27,28. We recently showed a low level of DNA methylation in the SNCA intron 1 region in hiPSC-derived dopaminergic NPCs obtained from a PD patient with the SNCA triplication23. 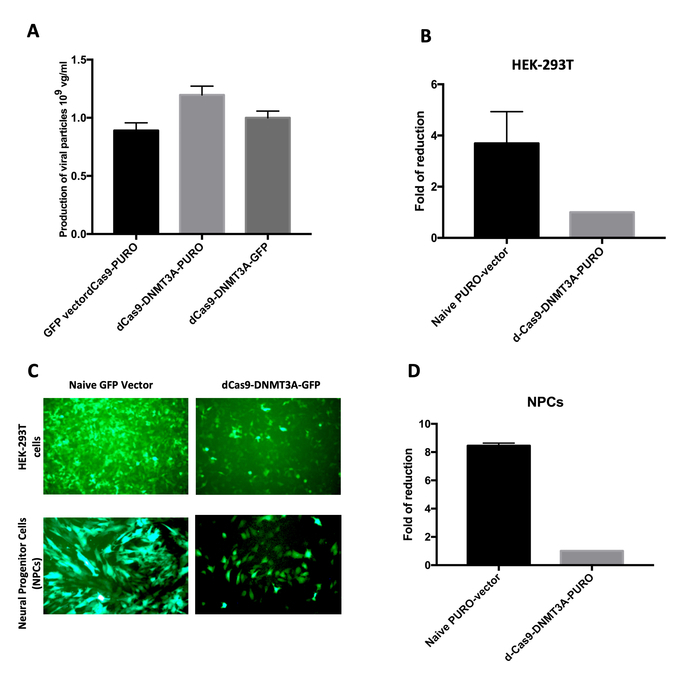 The advantage of this experimental model is that the NPCs can be robustly propagated in culture or further differentiated into mature neurons, enabling an efficient screening to identify genetic factors that mediate cellular phenotypes, including oxidative stress and apoptosis29. Furthermore, this model system enables scientists to recapitulate the developmental events that occurred prior to symptom onset in patients. In addition, hiPSC-derived NPCs represent a great tool to test the cellular and molecular pathways associated with gene expression. Importantly, hiPSC-derived NPCs combined with state-of-the-art CRISPR/Cas9-epigenome technology can greatly facilitate the development of “next-generation drugs” for many neurodegenerative diseases. To reduce pathological levels of SNCA expression, we recently developed a lentivirus-based system carrying a dCas9-DNMT3A fusion protein and gRNA to specifically target CpG methylation within the SNCA intron 1 (Figure 2A)23. This protocol will describe lentiviral vector (LV) design and production in detail. LVs represent an effective means of delivering CRISPR/dCas9 components for several reasons, namely (i) their capacity to carry bulky DNA inserts, (ii) a high efficiency of transducing a broad range of cells, including both dividing and nondividing cells30, and (iii) their ability to induce minimal cytotoxic and immunogenic responses. Recently, we applied the LV system to hiPSC-derived dopaminergic neurons from a patient with the triplication of the SNCA locus and demonstrated the therapeutic potential of LVs for the delivery of epigenome-editing methylation tools23 (Figure 2B). Indeed, an LV-gRNA/dCas9-DNMT3A system causes a significant increase in DNA methylation at the SNCA intron 1 region. This increase corresponds with the reduction in the levels of SNCA mRNA and protein23. Moreover, SNCA downregulation rescues PD-related phenotypes in the SNCA triplication/hiPSC-derived dopaminergic neurons (e.g., mitochondrial ROS production and cell viability)23. Importantly, we demonstrated that the reduction in SNCA expression by the LV-gRNA-dCas9-DMNT3A system is capable of reversing the phenotypes which are characteristic for hiPSC-derived dopaminergic neurons from a PD patient who carried the SNCA triplication, such as mitochondrial ROS production and cell viability23. The goal of this protocol is 1) to outline the protocol of production and concentration of an optimized LV platform for generating high-tittered viral preparations and 2) to describe the differentiation of hiPSCs into NPCs patterned to become mature dopaminergic neurons31,32 and the characterization of the methylation levels of the targeted region within SNCA intron 1. Lentiviral platforms have a major advantage over the most popular vector platform, namely adeno-associated vectors (AAVs), which is the former’s ability to accommodate larger genetic inserts33,34. AAVs can be generated at significantly higher yields but possess a low packaging capacity (<4.8 kb), compromising their use for delivering all-in-one CRISPR/Cas9 systems. Thus, it seems that the LVs would be the platform-of-choice in the applications involved in the delivery of CRISPR/dCas9 tools. Therefore, the protocol outlined here will be a valuable tool for researchers desiring to effectively deliver epigenome-editing components to the cells and organs. The protocol further outlines the strategy to increase the production and expression capabilities of the vectors via a modification in cis of the elements within the vector expression cassette30,35. The strategy is based on the novel system developed and studied in our lab and highlights its ability to produce viral particles in the range of 1010 viral units (VU)/mL30,35. NOTE: The construction of an all-in-one LV-gRNA-dCas9-DNMT3A vector is performed by using a production-and expression-optimized expression cassette published by Ortinski et al.30. 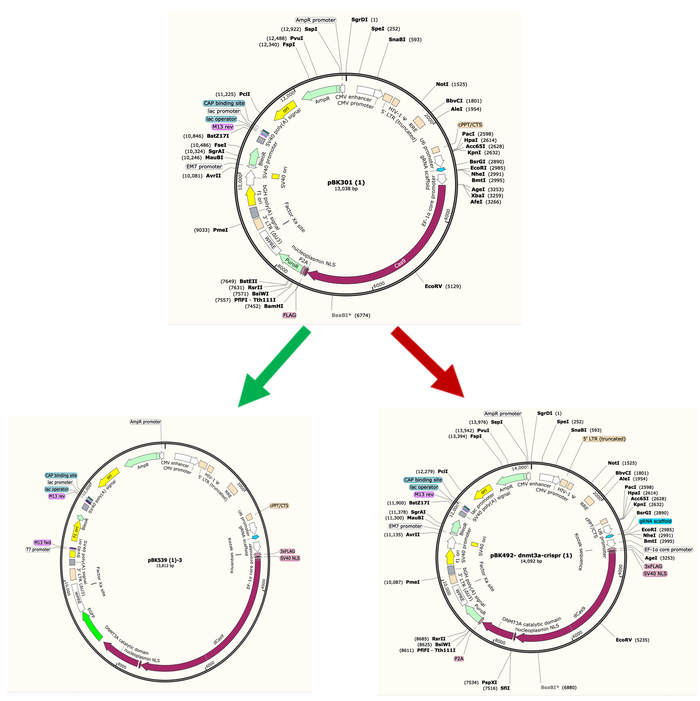 The vector cassette carries a repeat of the recognition site of transcription factor Sp1 and a state-of-the-art deletion within the untranslated (U3') region of a 3'-long terminal repeat (LTR) (Figure 2A)30,36. The vector backbone has been found to be effective in delivering and expressing CRISPR/Cas930,35. Obtain the deactivate (dead) version of SpCas9 (dCas9) via site-directed mutagenesis (data not shown). Replace the clone harboring D10A and H840A mutations in HNH and RuvC catalytic domains of the enzyme, respectively, with the active Cas9 in pBK30129 by exchanging between AgeI-BamHI fragments (Figure 3). Derive the DNMT3A catalytic domain from pdCas9-DNMT3A-eGFP (see Table of Materials) by amplifying the DNMT3A portion BamHI-429/R 5'-GAGCGGATCCCCCTCCCG-3' BamHI-429/L 5'-CTCTCCACTGCCGGATCCGG-3' (Figure 3). To amplify the region containing DNMT3A, use the following conditions: (1) 95 °C for 60 s, (2) 95 °C for 10 s, (3) 60 °C for 20 s, (4) 68 °C for 60 s. Repeat conditions 2 to 4 30x. For the final extension, use 68 °C for 3 min and hold 4 °C. Clone the DNMT3A fragment, digested by a BamHI restriction enzyme, into the BamHI site of the modified pBK301 vector carrying dCas9. Verify the cloning by direct Sanger sequencing. Note that the resulted plasmid harbors dCas9-DNMT3A-p2a-puromycin transgene. The plasmid expresses gRNA scaffold from human U6 promoter (Figure 3). Replace the puromycin reporter gene with green fluorescent protein (GFP) to create dCas9-DNMT3A-p2a-GFP. Digest dCas9-DNMT3A-p2a-Puro plasmid with FseI. Purify the vector fragment using a gel purification method. Prepare the insert by digesting pBK201a (pLenti-GFP) with FseI. Clone the FseI fragment into the vector. The resulted plasmid pBK539 harbors dCas9-DNMT3A-p2a-GFP transgene (Figure 3). NOTE: Human embryonic kidney 293T (HEK-293T) cells are cultured in complete high-glucose Dulbecco’s modified Eagle’s medium (DMEM; 10% bovine calf serum, 1x antibiotic-antimycotic, 1x sodium pyruvate, 1x nonessential amino acid, 2 mM L-glutamine) at 37 °C with 5% CO2. For the reproducibility of the protocol, it is recommended to test the calf serum when switching to a different lot/batch. Up to six 15 cm plates are needed for lentiviral production. Use low-passage cells to start a new culture (lower than passage 20). Once the cells reach 90%–95% confluence, aspirate the media and gently wash it with sterile 1x phosphate-buffered saline (PBS). Add 2 mL of trypsin-EDTA (0.05%) and incubate it at 37 °C for 3–5 min. To inactivate the dissociation reagent, add 8 mL of complete high-glucose DMEM, and pipette 10x–15x with a 10 mL serological pipette to create a single-cell suspension of 4 x 106 cells/mL. For the transfections, coat 15 cm plates with 0.2% gelatin. Add 22.5 mL of high-glucose medium and seed the cells by adding 2.5 mL of cell suspension (total ~1 x 107 cells/plate). Incubate the plates at 37 °C with 5% CO2 until 70%–80% confluence is reached. Prepare 2x BES-buffered solution BBS and 1 M CaCl2, according to Vijayraghavan and Kantor35. Filter the solutions by passing them through a 0.22 µm filter and store them at 4 °C. The transfection mix has to be clear prior to its addition to the cells. If the mix becomes cloudy during incubation, prepare fresh 2x BBS (pH = 6.95). To prepare the plasmid mix, use the four plasmids as listed (the following mix is sufficient for one 15 cm plate): 37.5 µg of the CRISPR/dCas9-transfer vector (pBK492 [DNMT3A-Puro-NO-gRNA] or pBK539 [DNMT3A-GFP-NO-gRNA]); 25 µg of pBK240 (psPAX2); 12.5 µg of pMD2.G; 6.25 µg of pRSV-rev (Figure 4A). Calculate the volume of the plasmids based on the concentrations and add the required quantities into a 15 mL conical tube. Add 312.5 µL of 1 M CaCl2 and bring the final volume to 1.25 mL, using sterile dd-H2O. Gently add 1.25 mL of 2x BBS solution while vortexing the mix. Incubate for 30 min at room temperature. The cells are ready for transfection once they are 70%–80% confluent. Aspirate the media and replace it with 22.5 mL of freshly prepared high-glucose DMEM without serum. Add 2.5 mL of the transfection mixture dropwise to each 15 cm plate. Swirl the plates and incubate at 37 °C with 5% CO2 for 2–3 h.
After 3 h, add 2.5 mL (10%) of serum per plate and incubate overnight at 37 °C with 5% CO2. On day 1 after the transfection, observe the cells to ensure that there is no or minimal cell death and that the cells formed a confluent culture (100%). Change the media by adding 25 mL of freshly prepared high-glucose DMEM and 10% serum to each plate. Incubate at 37 °C with 5% CO2 for 48 h.
Collect the supernatant from all the transfected cells and pool them in 50 mL conical tubes. Centrifuge at 400–450 x g for 10 min. Filter the supernatant through a 0.45 µm vacuum filter unit. After filtration, the supernatant can be kept at 4 °C for short-term storage (up to 4 days). For long-term storage, prepare aliquots and store them at -80 °C. NOTE: The nonconcentrated viral preparations are expected to be ~2 x 107 to 3 x 107 vu/mL (refer to section 1.5 for titer determination). It is highly recommended to prepare single-use aliquots, since multiple freeze-thaw cycles will result in a 10%–20% loss in functional titers. NOTE: For the purification, a two-step double-sucrose method involving a sucrose gradient step and a sucrose cushion step is performed (Figure 4B). To create a sucrose gradient, prepare the conical ultracentrifugation tubes in the following order: 0.5 mL of 70% sucrose in 1x PBS, 0.5 mL of 60% sucrose in DMEM, 1 mL of 30% sucrose in DMEM, and 2 mL of 20% sucrose in 1x PBS. Carefully, add the supernatant, collected according to section 1.4, to the gradient. Since the total volume collected from four 15 cm plates is 100 mL, use six ultracentrifugation tubes to process the viral supernatant. Equally distribute the viral supernatant among each ultracentrifugation tube. To avoid tube breakage during centrifugation, fill the ultracentrifugation tubes to at least three-fourth of their total volume capacity. Balance the tubes with 1x PBS. Centrifuge the samples at 70,000 x g for 2 h at 17 °C. NOTE: To maintain the sucrose layer during the acceleration and deceleration steps, allow the ultracentrifuge to slowly accelerate and decelerate the rotor from 0 to 200 x g and from 200 to 0 x g during the first and last 3 min of the spin, respectively. Gently collect 30%–60% sucrose fractions into clean tubes (Figure 4B). Add 1x PBS (cold) up to 100 mL of total volume. Mix by pipetting multiple times. Carefully, stratify the viral preparation on a sucrose cushion by adding 4 mL of 20% sucrose (in 1x PBS) to the tube. Continue by pipetting ~20–25 mL of the viral solution per each tube. Fill the tubes with 1x PBS if the volume of their contents is less than three-fourth per tube. Carefully balance the tubes. Centrifuge at 70,000 x g for 2 h at 17 °C. Empty the supernatant and invert the tubes on paper towels to allow the remaining liquid to drain. Remove all the liquid by cautiously aspirating the remaining liquid. Note that, at this step, pellets containing the virus are barely visible as small translucent spots. Add 70 µL of 1x PBS to the first tube to resuspend the pellet. Thoroughly pipette the suspension and transfer it to the next tube until all pellets are resuspended. Wash the tubes with an additional 50 µL of 1x PBS and mix as before. Note that, at this step, the volume of the final suspension is ~120 µL and appears slightly milky. To obtain a clear suspension, proceed with a 60 s centrifugation at 10,000 x g. Transfer the supernatant to a new tube, make 5 µL aliquots, and store them at -80 °C. ​NOTE: Lentiviral vector preparations are sensitive to the repeated cycles of freezing and thawing. In addition, it is suggested that the remaining steps are done in tissue culture containment or in designated areas qualified in terms of being at adequate levels of biosafety standards (Figure 4B). NOTE: The estimation of viral titers is performed using the p24 enzyme-linked immunosorbent assay (ELISA) method (p24gag ELISA) and according to the National Institutes of Health (NIH) AIDS Vaccine Program protocol for the HIV-1 p24 Antigen Capture Assay with slight modifications. Use 200 µL of 0.05% Tween 20 in cold 1x PBS (PBS-T) to wash the wells of a 96-well plate 3x. To coat the plate, use 100 µL of monoclonal anti-p24 antibody diluted at 1:1,500 in 1x PBS. Incubate the plate overnight at 4 °C. Prepare blocking reagent (1% bovine serum albumin [BSA] in 1x PBS) and add 200 µL to each well to avoid nonspecific binding. Use 200 µL of PBS-T to wash the well 3x for at least 1 h at room temperature. Proceed with the sample preparation. When working with concentrated vector preparations, dilute the vector at 1:100 by using 1 µL of the sample, 89 µL of dd-H20, and 10 µL of Triton X-100 (at a final concentration of 10%). For nonconcentrated preparations, dilute the samples at 1:10. Obtain HIV-1 standards by using a twofold serial dilution (the starting concentration is 5 ng/mL). Dilute the concentrated samples (prepared in step 1.6.4) in RPMI 1640 supplemented with 0.2% Tween 20 and 1% BSA to obtain 1:10,000, 1:50,000, and 1:250,000 dilutions. Similarly, dilute the nonconcentrated samples (prepared in step 1.6.4) in RPMI 1640 supplemented with 0.2% Tween 20 and 1% BSA to establish 1:500, 1:2,500, and 1:12,500 dilutions. Add the samples and standards on the plate in triplicates. Incubate overnight at 4 °C. The next day, wash the wells 6x. Add 100 µL of polyclonal rabbit anti-p24 antibody, diluted at 1:1,000 in RPMI 1640, 10% fetal bovine serum (FBS), 0.25% BSA, and 2% normal mouse serum (NMS), and incubate at 37 °C for 4 h.
Wash the wells 6x. Add goat anti-rabbit horseradish peroxidase IgG diluted at 1:10,000 in RPMI 1640 supplemented with 5% normal goat serum, 2% NMS, 0.25% BSA, and 0.01% Tween 20. Incubate at 37 °C for 1 h.
Wash the wells 6x. Add TMB peroxidase substrate and incubate at room temperature for 15 min. To stop the reaction, add 100 µL of 1 N HCl. In a microplate reader, measure the absorbance at 450 nm. Use the viral suspension to obtain a 10-fold serial dilution (from 10-1 to 10-5) in 1x PBS. Plate 5 x 105 HEK-293T cells in each well of a 6-well plate. Apply 10 µL of each viral dilution to the cells and incubate at 37 °C with 5% CO2 for 48 h.
Proceed to the fluorescence-activated cell sorting (FACS) analysis as follows: detach cells by adding 200 µL of 0.05% trypsin-EDTA solution. Incubate the cells at 37 °C for 5 min and resuspend them in 2 mL of DMEM medium (with serum). Collect the samples into a 15 mL conical tube and centrifuge at 400 x g at 4 °C. Resuspend the pellet in 500 µL of cold 1x PBS. Fix the cells by adding 500 µL of 4% paraformaldehyde (PFA) and incubate for 10 min at room temperature. Centrifuge at 400 x g at 4 °C and resuspend the pellet in 1 mL of 1x PBS. Analyze the GFP expression using a FACS instrument, as described in Ortinski et al.30. To determine the virus functional titer, use the following formula. V = volume used for transduction (in microliters). NOTE: Determine the multiplicity of infection (MOI) that is employed for transduction. Test a wide range of MOIs (from MOI = 1 to MOI = 10). Seed 3 x 105 to 4 x 105 HEK-293T cells per each well of a 6-well plate. When the cells reach >80% confluence, transduce them with the vector at the MOI of interest. Incubate at 37 °C with 5% CO2, and monitor the GFP signal in the cells for 1–7 days. Count the number of GFP-positive cells. Employ a fluorescent microscope (Plan 4x objective, 0.1 N.A., 40x magnification) using a GFP filter (excitation wavelength = 470 nm, emission wavelength = 525 nm). Use untransduced cells to set the control population of GFP-negative cells. Employ the following formula to determine the functional titer of the virus. V = volume of virus used for transduction. NOTE: Calculate the results following this example: for 10 GFP-positive cells (N) counted at a dilution (D) of 10-4 (1:10,000) at 20x magnification (M) in a 10 µL sample (V), the TU per milliliter will be (10 x 104) x (20) x (10) x (100) = 2 x 108 vu/mL. NOTE: hiPSCs from a patient with the triplication of the SNCA locus, ND34391, were obtained from the National Institute of Neurological Disorders and Stroke (NINDS) catalog (see Table of Materials). Culture hiPSCs under feeder-independent conditions in feeder-free ESC-iPSC culture medium (see Table of Materials) onto hESC-qualified basic matrix membrane (BMM)-coated plates (see Table of Materials). Wash confluent colonies with 1 mL of DMEM/F12, add 1 mL of dissociation reagent (see Table of Materials), and incubate for 3 min at room temperature. Aspirate the dissociation reagent and add 1 mL of feeder-free ESC-iPSC culture medium. Scrape the plate using a cell lifter and resuspend the colonies in 11 mL of feeder-free ESC-iPSC culture medium by pipetting 4x–5x using borosilicate pipettes. Plate 2 mL of colony suspension onto BMM-coated plates and place the plate at 37 °C with 5% CO2. Perform a daily medium change and split the cells every 5–7 days. NOTE: The differentiation of hiPSCs into dopaminergic neural progenitor cells (MD NPCs) is performed using a commercially available neural induction medium protocol per manufacturers’ instructions, with slight modifications31,32 (see Table of Materials). The first day of the differentiation is considered as day 0. High-quality hiPSCs are required for efficient neural differentiation. The induction of MD NPCs is performedusing an embryoid body (EB)-based protocol. Prior to starting the differentiation of hiPSCs, prepare a microwell culture plate (see Table of Materials) according to its manufacturer’s instructions. After preparing the microwell culture plate, add 1 mL of neural induction medium (NIM; see Table of Materials) supplemented with 10 µM Y-27632. Set the plate aside until ready to use. Wash hiPSCs with DMEM/F12, add 1 mL of cell detachment solution (see Table of Materials), and incubate for 5 min at 37 °C with 5% CO2. Resuspend single cells in DMEM/F12 and centrifuge them at 300 x g for 5 min. Carefully aspirate the supernatant and resuspend the cells in NIM + 10 µM Y-27632 to obtain a final concentration of 3 x 106 cells/mL. Add 1 mL of the single-cell suspension to a single well of the microwell culture plate and centrifuge the plate at 100 x g for 3 min. Examine the plate under the microscope to ensure an even distribution of the cells among the microwell, and incubate the cells at 37 °C with 5% CO2. On days 1–4, perform a daily partial medium change. Using a 1 mL micropipette, remove 1.5 mL of the medium and discard. Slowly, add 1.5 mL of fresh NIM without Y-27632. Repeat step 2.2.10 until day 4. On day 5, coat one well of a 6-well plate with BMM. Place a 37 µm reversible strainer (see Table of Materials) on top of a 50 mL conical tube (waste). Point the arrow of the reversible strainer upward. Remove the medium from the microwell culture plate without disturbing the formed EBs. Add 1 mL of DMEM/F12 and promptly collect the EBs with the borosilicate pipette and filter them through the strainer. Repeat step 2.2.15 until all EBs are removed from the microwell culture plate. Invert the strainer over a new 50 mL conical tube and add 2 mL of NIM to collect all the EBs. Plate 2 mL of the EB suspension into a single well of the BMM-coated plate using a borosilicate pipette. Incubate the EBs at 37 °C with 5% CO2. On day 6, prepare 2 mL of NIM + 200 ng/mL SHH (see Table of Materials) and perform a daily medium change. On day 8, examine the percentage of neuronal induction. Count all attached EBs and, specifically, determine the number of each individual EB that is filled with neural rosettes. Quantify the neural rosette induction using the following formula. NOTE: If the neural induction is <75%, neural rosette selection may be inefficient. On day 12, prepare 250 mL of N2B27 medium with 119 mL of neurobasal medium, 119 mL of DMEM/F12 medium, 2.5 mL of GlutaMAX, 2.5 mL of NEAA, 2.5 mL of N2 supplement, 5 mL of B27 without vitamin A, 250 μL of Gentamicin (50 mg/mL), and 19.66 μL of BSA (7 mg/mL). To prepare 50 mL of complete N2B27 medium, add 3 μM CHIR99021, 2 μM SB431542, 20 ng/mL bFGF, 20 ng/mL EGF, and 200 ng/mL SHH. NOTE: It is important to prepare the completed medium right before use. Aspirate medium from the wells containing the neural rosettes and wash with 1 mL of DMEM/F12. Ad 1 mL of neural rosette selection reagent (see Table of Materials) and incubate at 37 °C with 5% CO2 for 1 h.
Remove the selection reagent and, using a 1 mL pipettor, aim directly at the rosette clusters. Add the suspension to a 15 mL conical tube and repeat steps 2.2.25 and 2.2.26 until the majority of the neural rosette clusters have been collected. NOTE: To avoid contamination with nonneuronal cell types, do not overselect. Centrifuge the rosette suspension at 350 x g for 5 min. Aspirate the supernatant and resuspend the neural rosettes in N2B27 + 200 ng/mL SHH. Add the neural rosette suspension to a BMM-coated well and incubate the plate at 37 °C with 5% CO2. On days 13–17, perform a daily medium change using completed N2B27 medium. Passage the cells when the cultures are 80%–90% confluent. To split the cells, prepare a BMM-coated plate. Wash the cells with 1 mL of DMEM/F12, aspirate the medium, and add 1 mL of dissociation reagent (see Table of Materials). Incubate for 5 min at 37 °C, add 1 mL of DMEM/F12, and dislodge attached cells by pipetting up and down. Collect the NPC suspension in a 15 mL conical tube. Centrifuge at 300 x g for 5 min. Aspirate the supernatant and resuspend the cells in 1 mL of complete N2B27 + 200 ng/mL SHH. Count the cells and plate them at a density of 1.25 x 105 cells/cm2, and incubate the cells at 37 °C with 5% CO2. Change the medium every other day, using complete N2B27 + 200 ng/mL SHH. NOTE: At this passage, NPCs are considered as passage (P) 0. SHH can be withdrawn from the N2B27 medium at P2. Passage the cells once they reach 80%–90% confluence. At this stage, confirm that the cells express Nestin and FoxA2 markers by using immunocytochemistry and qPCR. This protocol leads to the generation of 85% double-positive cells for the Nestin and FoxA2 markers. For passaging cells, repeat steps 2.2.31–2.2.36. Freeze the cells, starting from passage P2. For the freezing of cells, repeat steps 2.2.31–2.2.36 and resuspend the cell pellet at 2 x 106 to 4 x 106 cells/mL using cold neural progenitor freezing medium (see Table of Materials). Transfer 1 mL of the cell suspension into each cryovial and freeze the cells using a standard slow-rate-controlled cooling system. For long-term storage, keep the cells in liquid nitrogen. Prepare a BMM-coated plate and warm complete N2B27. Add 10 mL of warm DMEM/F12 to a 15 mL conical tube. Place a cryovial in a 37 °C heat block for 2 min. Transfer the cells from the cryovial to the tube containing DMEM/F12. Centrifuge at 300 x g for 5 min. Aspirate the supernatant, resuspend the cells in 2 mL of N2B27, and add the cell suspension to one well of the BMM-coated plate. Incubate the cells at 37 °C with 5% CO2. Transduce MD NPCs at 70% confluence with LV-gRNA/dCas9-DNMT3A vectors at MOI = 2. Replace the N2B27 medium 16 h posttransduction. Add N2B27 with 5 µg/mL puromycin, 48 h after the transduction. Culture the cells for 3 weeks into N2B27 plus puromycin to obtain the stable MD NPC lines. Cells are ready for downstream applications (DNA, RNA, protein analyses, phenotypic characterization23, freezing and passaging). Extract DNA from each stably transduced cell line using a DNA extraction kit (see Table of Materials). Use 800 ng of DNA to perform a bisulfite conversion, using a commercially available kit (see Table of Materials). After the bisulfite conversion, elute the bisulfite-converted DNA to 20 ng/µL. Prepare the PCR master mix in a nuclease-free tube. For each reaction, use 0.4 µL of reverse primer (10 µM), 0.4 µL of forward primer (10 µM), 1.6 µL of MgCl2 (25mM), 2 µL of 10x CoralLoad Concentrate, 10 µL of 2x PCR master mix, 4 µL of 5x Q-Solution, 1 µL of DNA, and 0.6 µL of nuclease-free water. Transfer the reaction plate to a thermocycler and perform PCR using the following conditions: 95 °C for 15 min, 50 cycles of 94 °C for 30 s, 56 °C for 30 s, and 72 °C for 30 s, with a final 10 min extension step at 72 °C. Primers used for the pyrosequencing of SNCA intron 1 are listed in Table 1, Figure 7A, and Supplementary Figure 1. After amplification, visualize the amplicons using 2 µL of PCR product with ethidium bromide staining, following agarose gel electrophoresis. Pyrosequencing assays are validated by using mixtures of unmethylated (U) and methylated (M) bisulfite-converted DNAs in the following ratios, namely 100U:0M, 75U:25M, 50U:50M, 25U:75M, and 0U:100M (see Table of Materials). Conduct pyrosequencing using pyrosequencing reagents (see Table of Materials), and calculate the methylation values for each CpG site using pyrosequencing software. For a detailed pyrosequencing protocol, refer to Bassil et al.37. We performed p24gag ELISA to compare between physical titers of LV-dCas9-DNMT3A-GFP/Puro with the naive GFP/Puro counterparts. Representative results, presented in Figure 5A, demonstrate that physical yields of the vectors, generated using the protocol herein outlined, are comparable. This suggests that the utility of the optimized vector backbone, combined with the optimized production protocol, results in high-yield titer of the CRISPR/dCas9 vectors. To evaluate the efficiency of the packaging of dCas9-DNMT3A transgene into the viral particles, we performed a transduction of the concentrated vector into HEK-293T cells (Figure 5B). Notwithstanding, the results reported in Figure 5A showed that the transduction rates of the LV-dCas9-DNMT3A-GFP vector was significantly lower than that of the naive GFP vector (Figure 5B). In fact, the functional titer of the LV-dCas9-DNMT3A-GFP vector was four times lower than that of the naive counterpart, suggesting that the packaging efficiency of the CRISPR/dCas9 RNA is reduced. Furthermore, the LV-dCas9-DNMT3A-Puro vector formed puromycin-resistant colonies at a rate that was fivefold lower compared with the naive-Puro counterpart. We also tested the efficiency of the transduction of the LV-dCas9-DNMT3A-Puro vectors in the MD NPCs. To this end, cells were transduced with a naive LV-GFP vector and LV-dCas9-DNMT3A-Puro at MOI = 1. As shown in Figure 5C, the transduction rates of the Puro control vector were fivefold higher compared with the dCas9-DNMT3A vector. These results were confirmed by using GFP versions of the vectors (Figure 5D). As suggested in the discussion section, with lower packaging/expression characteristics of the LV-epigenome-editing system described here, its levels are sufficient to induce sustainable DNA methylation on the target sequences. Furthermore, these characteristics can be improved by scaling up the production procedure. The EB-based protocol described here allows the differentiation of MD NPCs (Figure 6A). We assessed the differentiation process by using specific markers at different stages. 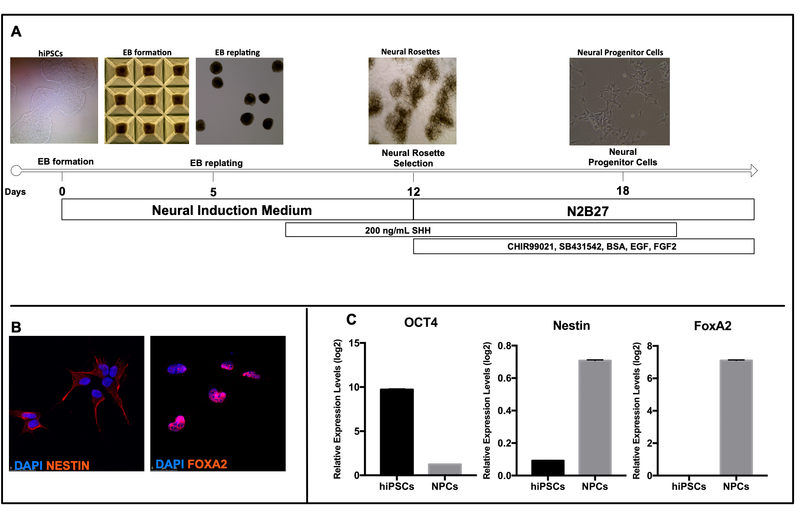 hiPSCs expressed pluripotency marker OCT4, while the MD NPCs expressed both Nestin and FOXA2 (Figure 6B,C). We previously reported that this differentiation protocol produces 83.3% of cells that are double positive for the Nestin and FOXA2 markers31, confirming the successful differentiation of these cells. At least 75%–80% of the cells need to show the cell-specific markers. A lower yield (<50%) of positive cells for the markers will require another differentiation protocol. Seven pyrosequencing assays (Table 1, Supplementary Figure 1, Figure 7A) were designed and validated for the quantification of the methylation status in the SNCA intron 1. The Chr4: 89,836,150-89,836,593 (GRCh38/hg38) region contains 23 CpGs. The designed assays were validated for linearity using different mixtures of unmethylated (U) and methylated (M) bisulfite-converted DNAs as standards. Mixtures were used in the following ratios, namely 100U:0M, 75U:25M, 50U:50M, 25U:75M, and 0U:100M. All seven assays were validated (Figure 7B) and showed linear correlation R2 > 0.93. Assays that were not validated were redesigned. Using the validated assays, it was possible to determine the methylation levels at the 23 CpGs in the SNCA intron 1 (Figure 7C). Figure 1: Epigenome-editing tools for gene activation and repression. (A) Closed conformation of the DNA shows the heterochromatin organization. The effector molecules, including VP64, P65, rta, DNA demethylation enzyme, and tet-1 can be recruited to the regulatory regions (promoters, introns, etc.) via pairing with dCas9-gRNA system. The recruitment of the system results in chromatin remodeling that leads to the establishment of open chromatin organization (euchromatin) associated with gene activation. (B) Epigenome-based silencing can be achieved by recruiting dCas9 repressory complexes, including KRAB, HDACs, and DNA methylation enzyme, DNMT3A to the regulatory regions (promoters, introns, etc.) via tethering with gRNA component. The recruitment of the system results in gene deactivation (silencing), associated with DNA chromatin remodeling, and in the inaccessibility of the general transcription machinery to the chromatin structure. Please click here to view a larger version of this figure. Figure 2: Design of lentiviral vectors for targeted DNA methylation within SNCA triplicated loci. (A) The production- and expression-optimized vector backbone is described in detail by Kantor et al.23, Ortinski et al.30, and Vijayraghavan and Kantor35. The annotations of the vector’s cis elements are a vector packaging element (ψ, psi), the Rev response element (RRE), Sp1-binding sites (Sp1), human U6 promoter (hU6), a core-elongation factor 1α promoter (EFS-NC), and the woodchuck hepatitis virus posttranscriptional regulatory element (WPRE). (B) Schematic representation of the SNCA triplicated locus. DNA methylation is an important transcriptional regulation mechanism that directly or indirectly limits DNA accessibility21. Increased SNCA expression was observed coincidentally to low CpG methylation levels in the SNCA intron 1 (green arrows label the activated gene expression state of the triplicated SNCA locus). The recruitment of LV-gRNA/dCas9-DNMT3A vectors teeter the methyltransferase enzyme to the SNCA intron 1 region. This results in the assembly of closed chromatin which results in the transcriptional downregulation of SNCA (red arrows). Please click here to view a larger version of this figure. Figure 3: A construction of a lentiviral vector expression cassette carrying dCas9-DNMT3A transgene. The parental vector, pBK301, is described in Ortinski et al.30. The vector was cloned with dCas9-DNMT3A-Puro (pBK492) or dCas9-DNMT3A-GFP (pBK539) (the cloning flow can be found in protocol and in Kantor et al.23). Please click here to view a larger version of this figure. Figure 4: Lentiviral vector packaging, production, and purification. (A) Transient transfection protocol used for the production of LV-gRNA/dCas9-DNMT3A. To generate vectors, HEK-293T cells were transfected with vesicular stomatitis virus G-protein (VSV-G), packaging, and expression plasmids23. Viral particles were collected from the culture supernatants. The second generation of the packaging system was used to supplement the expression cassettes. The system harbored Tat and Rev proteins. The Rev plasmid, pRSV-REV, was supplemented separately. Abbreviations: pCMV = cytomegalovirus promoter; LTRs = long terminal repeats; VSV-G = vesicular stomatitis virus G-protein; RRE = Rev response element; Sp1 = transcription factor Sp1-binding sites; ψ = the vector packaging element (psi); WPRE = woodchuck hepatitis virus posttranscriptional regulatory element; EFS-NC = a core-elongation factor 1α promoter; hU6 = human U6 promoter. (B) The vector purification and concentration has been executed as follows: the double-sucrose gradient protocol was used to purify and concentrate viral particles following transient transfection (see above). Briefly, culture supernatant (SN) was collected and loaded on a sucrose gradient. To create the gradient, 70%, 60%, 30%, and 20% sucrose solutions dissolved in 1x PBS were used. The second step of purification included the ultracentrifugation against a cushion of 20% sucrose. The formed pellet was resuspended in 1x PBS. Please click here to view a larger version of this figure. Figure 5: Evaluation of viral titers. (A) p24 ELISA assay. A tittering procedure has been performed as described by Kantor et al.23. The naive (GFP) vector is highlighted in the black bar. The LV-dCas9-DNMT3A-Puro vector (light-blue bar) and LV-dCas9-DNMT3A-GFP vector (green bar) are also highlighted. The physical particle production of the vectors has been evaluated. The results are recorded in copy numbers per milliliter, where 1 ng of p24gag = 1 x 104 viral particles. The bar graph data represents the mean ± SD from three independent experiments. (B) Evaluation of the functional titers following transduction into HEK-293T cells. The Puro-containing LVs were transduced into HEK-293T cells as described in representative results. The functional titers of the viral production were measured by counting the number of colonies following puromycin selection. The results were calculated as the ratio of the number of colonies obtained from the lentiviral vector-Puro (control vector) relative to the dCas9-DNMT3A-Puro counterpart. The bar graph represents the mean ± SD from three independent experiments. (C) Evaluation of transduction efficiency and expression of the vectors in HEK-293T cells (upper panel) and NPCs (lower panel). The left panels represent the naive (GFP) vector transductions. The right panels represent dCas9-DNMT3A- GFP vector’s transductions. Three days posttransduction, images were collected using a fluorescence microscope (40x). (D) Evaluation of the functional titers following transduction into NPCs. The Puro-containing LVs were transduced into NPCs as described in representative results and the results were calculated as in panel B. The bar graph represents the mean ± SEM of three biological replicates. Abbreviations: HEK-293T = human embryonic kidney 293T; NPCs = neural progenitor cells. Please click here to view a larger version of this figure. Figure 6: Differentiation and characterization of hiPSC-derived MD NPCs. (A) Timeline showing the differentiation of hiPSC-derived MD NPCs. Quantification of MD NPC markers using (B and C) immunocytochemistry and (D and E) real-time (RT) PCR. The levels of each mRNA were calculated relative to the geometric mean of GAPDH-mRNA and PPIA-mRNA reference controls using the 2-ΔΔCT method. Each column represents the mean of two biological and technical replicates. The error bars represent the SEM. Please click here to view a larger version of this figure. 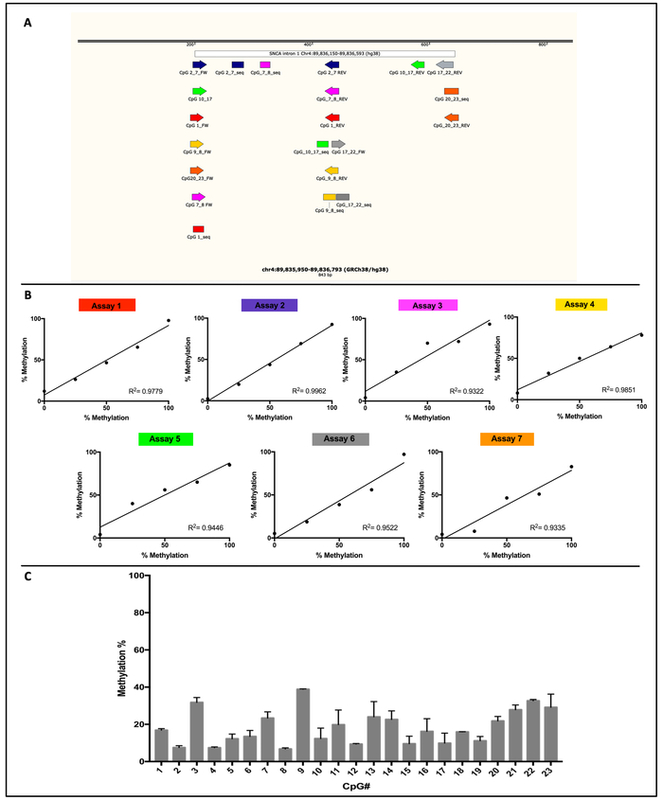 Figure 7: Quantitative validation of the pyrosequencing assays targeting SNCA intron 1. (A) Overview of the pyrosequencing assays in the SNCA intron 1. (B) The designed assays were validated by using different ratios of unmethylated (U) and methylated (M) bisulfite-converted DNA, namely 100U:0M, 75U:25M, 50U:50M, 25U:75M, and 0U:100M. (C) Validated assays were used to measure the percentage of methylation of the 23 CpGs in the SNCA intron 1 in hiPSC-derived MD NPCs from a patient with the triplication of the SNCA locus. The bars represent the mean of the percentage of methylated CpGs in two independent experiments, and the error bars show the SEM. Please click here to view a larger version of this figure. Table 1: Pyrosequencing assays for the evaluation of SNCA intron 1 CpG methylation levels. Supplementary Figure 1: Overview of the pyrosequencing assays in the SNCA intron 1. Please click here to download this file. LVs have begun to emerge as the vehicle of choice for epigenome editing, especially in the context of genetic diseases, mainly due to their ability to (i) accommodate large DNA payloads and (ii) efficiently transduce a wide range of dividing and nondividing cells. The large packaging efficacy of the LVs is especially beneficial for the applications involving packaging of the CRISPR/dCas9 systems which are oversized. From this perspective, LVs represent the platform-of-choice for the delivery of all-in-one CRISPR/Cas9 systems. Indeed, the AAV platform, that is commonly employed for preclinical and clinical gene therapy applications, is not fully capable to accommodate large packaging sizes of the dCas9-effector systems. In fact, the strict packaging requirements of the AAV vectors are prohibiting their use for the delivery of CRISPR/dCas9 components. To improve AAV packaging capability, several novel AAV-based platforms have been developed. For example, a split-intein approach separating a Cas9 system into two AAV cassettes has been recently constructed38. The approach has increased the overall packaging capacity; however, it required the production and cotransduction of two AAV vectors38. The discovery of SaCas9, derived from Staphylococcus aureus, allowed the development of SaCas9/guide RNA system39,40. SaCas9 is a shorter, but equally potent Cas9 enzyme, easily packaged into AAV vectors. In vivo experiments have shown that this system efficiently targets the cholesterol regulatory gene PCSK940. Nevertheless, the packaging efficiency of all-in-one AAV vectors needs further improvement. Considering the clear advantages of LV delivery system, we recently developed and used a lentiviral backbone-harbored dCas9-DNMT3A transgene, as well as a gRNA scaffold. To test the therapeutic potential of this novel system, we applied it to PD hiPSC-derived neurons carried SNCA loci triplication23. We validated the efficiency of this system that resulted in the fine-tuned downregulation of SNCA-mRNA and protein levels23. Importantly, the system demonstrated the ability to rescue disease-related cellular phenotypes, suggesting the great potential of the approach for the epigenome-based therapies23. To increase the production of the vectors, we recently introduced several modifications into the vector expression cassette, including the integration of Sp1 sites, deletion in 3'LTR, and a down-sizing of the expression plasmid (see in the next paragraph)30. The production method presented here enables the generation of LV-CRISPR/dCas9 vectors at the titers in the range of 1 x 1010 vu/mL (Figure 5). As highlighted above, to achieve higher production titers, we added a repeat of the transcription factor Sp1-binding site into an all-in-one CRISPR/Cas9 expression vector cassette and introduced a state-of-the-art deletion into the U3 region of 3'LTR. These modifications resulted in a significant upregulation in the vector packaging efficiency (~2.5x) as well as a transgene expression (about sevenfold)30,35. These improvements are in accord with previously generated data41,42,43,44. The optimized vector cassette, packaged into viral particles, generates titers of approximately 1 x 1010 vu/mL per ~5 x 107 producer cells. In the case of production of the vectors at lower titers, the following improvements should be considered. 1) Use HEK-293T cells at a low passage number. Replace the cells regularly after ≥20 passages. Also, replace the cells when they show a slow growth rate. 2) Routinely check the components of the medium since they may contribute to the changes in the virus’ titer. Substitute fetal serum with cost-effective cosmic calf serum. 3) Different cell lines used for vector generation demonstrate distinct production fitness. For example, HEK-293T cells are capable of generating vectors at levels that are higher than the HEK-293FT cells by three times (data not shown). 4) The optimal transfection would be achieved when cells are at 70%–80% confluence. Lower densities would result in premature cell death as the factor of viral toxicity. However, the higher densities would result in a significant reduction in production efficiency. As a general rule, cell density prior to the transfection should allow the cells to divide one time before establishing a fully confluent culture. 5) Transfection titers also depend on the pH of the BBS reagent. As a general rule, we suggest testing a new batch of BBS in a pilot transfection setting prior to its use. The 2x BBS pH should be 6.95. It should be pointed out that even though Sp1-LVs carrying CRISPR/dCas9 transgenes are capable of generating titers in the vicinity of 1 x 1010 vu/mL per ~5 x 107 producer cells, which is comparable with a naive vector (Figure 5A), the efficiency of packaging of virus RNA is significantly compromised with dCas9-DNMT3A transgene. Indeed, we demonstrate an approximately fivefold reduction in the functional titers and expression capabilities of LV-dCas9-DNMT3A-Puro/GFP vectors (Figure 5B–D). The reduction in the packaging efficiency and the expression of the vectors may be a result of the DNMT3A overexpression. In this regard, it has been demonstrated that DNA methylation may play an important role in controlling HIV-1 replication and its gene expression. Therefore, it would be necessary to determine whether LVs are subject to a similar regulation and, if that is the case, to develop strategies to inducible-silence the DNMT3A activity during the vector production stage. Despite a lower production yield, the vectors demonstrate decent functional titers (in the low 109 range, which should suffice many applications, including those requiring in vivo delivery). It is worth noting that the production procedure could be easily upscaled, as discussed in the review, which should allow matching to titers obtained with other expression systems. To generate LVs, the following safety points should be considered. First, LVs require biosafety level 2 containments. Despite the relative safety of LVs (which stems from their SIN nature), residual transcriptional activity has been demonstrated22. Furthermore, LV genomes can be rescued by HIV-122. Due to all this, we highly recommend performing replication competence assays (especially on the concentrated preparations). For safety procedures regarding the handling of lentiviruses, we refer here to Biosafety in Microbiological and Biomedical Laboratories, 4th edition, published by the Centers for Disease Control (CDC; available online). For clinical applications, use the third generation of packaging system. Nevertheless, it should be noted that the use of third generation of the packaging systems associates with lower titers comparing with the second-generation packaging systems. The novel platform outlined here enhances the ever-expanding toolbox for the delivery of epigenome-editing components and other molecular cargos to cells and organs. Despite the recent advances in developing HIV-1-based systems, only a few platforms demonstrate the sustainable yields of the viral production. 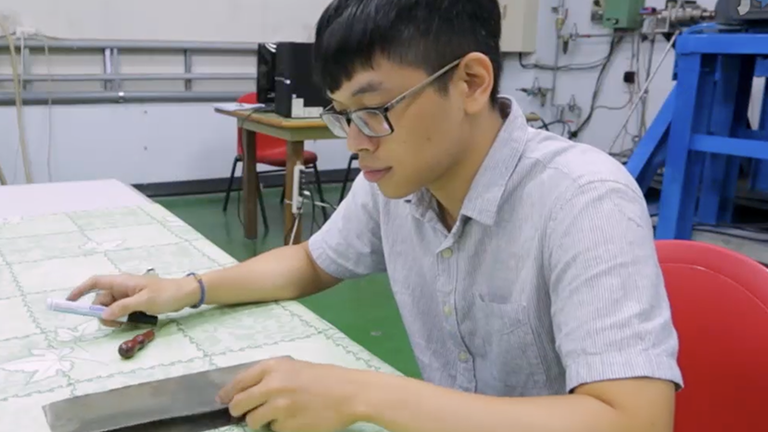 The optimization of the vector backbone reported here made it possible to address some of the issues associated with relatively low production efficiency of the vectors. To further improve the vector production characteristics, it would be valuable to test whether the vector yields and expression can be improved via the addition of multi-copied repeats of the same binding motif or by multiplexing the Sp1 motif with recognition sites for other factors. In this regard, the results presented here may offer a general strategy for the improvement of relatively weak tissue-specific promoters, such as human synapsin I (hSyn) and CamKIIa. We recently demonstrated that the long-term expression of LV-delivered Cas9/guide RNA may lead to undesirable off-target effects30. Even though this notion applied mostly to dividing cells, it would be highly beneficial to develop episomal vector systems able to transiently deliver the therapeutic cargoes. As mention above, AAV vectors are very valuable, transiently delivering vehicles; nevertheless, the low packaging ability greatly impact their use, especially for epigenome-editing applications. For this reason, integrase-deficient lentiviral vectors (IDLVs) would offer an attractive means for the delivery and expression of epigenome-editing tools based on CRISPR/dCas9. The following characteristics of the IDLV platform are particularly attractive: (i) the capacity to deliver genetic cargoes to a broad range of cells and organs; (ii) a superior packaging capacity—which is a considerable advantage over AAV vectors; (iii) the transient nature of delivery (which is a considerable advantage compared to the integrase-competent LVs)45,30. The episomal nature of the IDLV genomes highlights their very low integration rates and, as such, are greatly beneficial for the reduction of a risk of insertional mutagenesis. We recently optimized IDLV production and expression characteristics, creating the platform that is safe and efficient for delivery of CRISPR/Cas9 components30. Indeed, the improved IDLVs were capable of inducing rapid and sustained genome editing in HEK-293T cells and in postmitotic brain neurons. The system is characterized by transient expression and was found to be safer than the corresponding integrase-competent LVs. The adaptation of IDLV vectors for applications involving epigenome-editing manipulations would be highly advantageous for the gene therapy field. Duke University filed a provisional patent application related to this study. This work was funded in part by the Kahn Neurotechnology Development Award (to O.C.) and the National Institutes of Health/National Institute of Neurological Disorders and Stroke (NIH/NINDS) (R01 NS085011 to O.C.). Hsu, P. D., Lander, E. S., Zhang, F. Development and applications of CRISPR-Cas9 for genome engineering. Cell. 157, (6), 1262-1278 (2014). Gaj, T., Gersbach, C. A., Barbas, C. F. 3rd ZFN, TALEN, and CRISPR/Cas-based methods for genome engineering. Trends in Biotechnology. 31, (7), 397-405 (2013). Thakore, P. I., Black, J. B., Hilton, I. B., Gersbach, C. A. Editing the epigenome: technologies for programmable transcription and epigenetic modulation. Nature Methods. 13, (2), 127-137 (2016). Gilbert, L. A., et al. CRISPR-mediated modular RNA-guided regulation of transcription in eukaryotes. Cell. 154, (2), 442-451 (2013). Gilbert, L. A., et al. Genome-Scale CRISPR-Mediated Control of Gene Repression and Activation. Cell. 159, (3), 647-661 (2014). Perez-Pinera, P., et al. RNA-guided gene activation by CRISPR-Cas9-based transcription factors. Nature Methods. 10, (10), 973-976 (2013). Chavez, A., et al. Highly efficient Cas9-mediated transcriptional programming. Nature Methods. 12, (4), 326-328 (2015). Horlbeck, M. A., et al. Nucleosomes impede Cas9 access to DNA in vivo and in vitro. eLife. 5, (2016). Chavez, A., et al. Comparison of Cas9 activators in multiple species. Nature Methods. 13, (7), 563-567 (2016). Zhou, H., et al. In vivo simultaneous transcriptional activation of multiple genes in the brain using CRISPR-dCas9-activator transgenic mice. Nature Neuroscience. 21, (3), 440-446 (2018). Tanenbaum, M. E., Gilbert, L. A., Qi, L. S., Weissman, J. S., Vale, R. D. A protein-tagging system for signal amplification in gene expression and fluorescence imaging. Cell. 159, (3), 635-646 (2014). Konermann, S., et al. Genome-scale transcriptional activation by an engineered CRISPR-Cas9 complex. Nature. 517, (7536), 583-588 (2015). Holtzman, L., Gersbach, C. A. Editing the Epigenome: Reshaping the Genomic Landscape. Annual Review of Genomics and Human Genetics. (2018). Perez-Pinera, P., et al. Synergistic and tunable human gene activation by combinations of synthetic transcription factors. Nature Methods. 10, (3), 239-242 (2013). Thakore, P. I., et al. Highly specific epigenome editing by CRISPR-Cas9 repressors for silencing of distal regulatory elements. Nature Methods. 12, (12), 1143-1149 (2015). Amabile, A., et al. Inheritable Silencing of Endogenous Genes by Hit-and-Run Targeted Epigenetic Editing. Cell. 167, (1), 219-232 (2016). Liu, X. S., et al. Editing DNA Methylation in the Mammalian Genome. Cell. 167, (1), 233-247 (2016). McDonald, J. I., et al. Reprogrammable CRISPR/Cas9-based system for inducing site-specific DNA methylation. Biology Open. 5, (6), 866-874 (2016). Huang, Y. H., et al. DNA epigenome editing using CRISPR-Cas SunTag-directed DNMT3A. Genome Biology. 18, (1), 176 (2017). Vojta, A., et al. Repurposing the CRISPR-Cas9 system for targeted DNA methylation. Nucleic Acids Research. 44, (12), 5615-5628 (2016). Razin, A., Kantor, B. DNA methylation in epigenetic control of gene expression. Progress in Molecular and Subcellular Biology. 38, 151-167 (2005). Kantor, B., Ma, H., Webster-Cyriaque, J., Monahan, P. E., Kafri, T. Epigenetic activation of unintegrated HIV-1 genomes by gut-associated short chain fatty acids and its implications for HIV infection. Proceedings of the National Academy of Sciences of the United States of America. 106, (44), 18786-18791 (2009). Kantor, B., et al. Downregulation of SNCA Expression by Targeted Editing of DNA Methylation: A Potential Strategy for Precision Therapy in PD. Molecular Therapy. (2018). Jowaed, A., Schmitt, I., Kaut, O., Wullner, U. Methylation regulates alpha-synuclein expression and is decreased in Parkinson's disease patients' brains. Journal of Neuroscience. 30, (18), 6355-6359 (2010). Wang, Y., et al. A DNA methyltransferase inhibitor, 5-aza-2'-deoxycytidine, exacerbates neurotoxicity and upregulates Parkinson's disease-related genes in dopaminergic neurons. CNS Neuroscience & Therapeutics. 19, (3), 183-190 (2013). Matsumoto, L., et al. CpG demethylation enhances alpha-synuclein expression and affects the pathogenesis of Parkinson's disease. PLOS One. 5, (11), e15522 (2010). Desplats, P., et al. Alpha-synuclein sequesters Dnmt1 from the nucleus: a novel mechanism for epigenetic alterations in Lewy body diseases. Journal of Biological Chemistry. 286, (11), 9031-9037 (2011). Ai, S. X., et al. Hypomethylation of SNCA in blood of patients with sporadic Parkinson's disease. Journal of the Neurological Sciences. 337, (1-2), 123-128 (2014). Tagliafierro, L., Chiba-Falek, O. Up-regulation of SNCA gene expression: implications to synucleinopathies. Neurogenetics. 17, (3), 145-157 (2016). Ortinski, P. I., O’Donovan, B., Dong, X., Kantor, B. Integrase-Deficient Lentiviral Vector as an All-in-One Platform for Highly Efficient CRISPR/Cas9-Mediated Gene Editing. Molecular Therapy - Methods & Clinical Development. 5, 153-164 (2017). Tagliafierro, L., et al. Genetic analysis of alpha-synuclein 3' untranslated region and its corresponding microRNAs in relation to Parkinson's disease compared to dementia with Lewy bodies. Alzheimer’s & Dementia. 13, (11), 1237-1250 (2017). Tagliafierro, L., Zamora, M. E., Chiba-Falek, O. Multiplication of the SNCA locus exacerbates neuronal nuclear aging. Human Molecular Genetics. (2018). Kantor, B., McCown, T., Leone, P., Gray, S. J. Clinical applications involving CNS gene transfer. Advances in Genetics. 87, 71-124 (2014). Kantor, B., Bailey, R. M., Wimberly, K., Kalburgi, S. N., Gray, S. J. Methods for gene transfer to the central nervous system. Advances in Genetics. 87, 125-197 (2014). Vijayraghavan, S., Kantor, B. A Protocol for the Production of Integrase-deficient Lentiviral Vectors for CRISPR/Cas9-mediated Gene Knockout in Dividing Cells. Journal of Visualized Experiments. (130), e56915 (2017). Bayer, M., et al. A large U3 deletion causes increased in vivo expression from a nonintegrating lentiviral vector. Molecular Therapy. 16, (12), 1968-1976 (2008). Bassil, C. F., Huang, Z., Murphy, S. K. Bisulfite pyrosequencing. Methods in Molecular Biology. 1049, 95-107 (2013). Truong, D. J., et al. Development of an intein-mediated split-Cas9 system for gene therapy. Nucleic Acids Research. 43, (13), 6450-6458 (2015). Nishimasu, H., et al. Crystal Structure of Staphylococcus aureus Cas9. Cell. 162, (5), 1113-1126 (2015). Ran, F. A., et al. In vivo genome editing using Staphylococcus aureus Cas9. Nature. 520, (7546), 186-191 (2015). Van Lint, C., Ghysdael, J., Paras, P., Burny, A., Verdin, E. A transcriptional regulatory element is associated with a nuclease-hypersensitive site in the pol gene of human immunodeficiency virus type 1. Journal of Virology. 68, (4), 2632-2648 (1994). Van Lint, C., et al. Transcription factor binding sites downstream of the human immunodeficiency virus type 1 transcription start site are important for virus infectivity. Journal of Virology. 71, (8), 6113-6127 (1997). Goffin, V., et al. Transcription factor binding sites in the pol gene intragenic regulatory region of HIV-1 are important for virus infectivity. Nucleic Acids Research. 33, (13), 4285-4310 (2005). Kim, Y. S., et al. Artificial zinc finger fusions targeting Sp1-binding sites and the trans-activator-responsive element potently repress transcription and replication of HIV-1. Journal of Biological Chemistry. 280, (22), 21545-21552 (2005). Kantor, B., et al. Notable reduction in illegitimate integration mediated by a PPT-deleted, nonintegrating lentiviral vector. Molecular Therapy. 19, (3), 547-556 (2011).